The UK is one of only five European members that still allow animal snares to be used. Each year cats and dogs are injured or killed by snares. When caught in a snare, a rabbit will cry out in distress. Snares cause badgers serious injuries. The Duke of Norfolk is one of England’s largest landowners. His ancestral seat is Arundel Castle, Sussex where he heavily snares on the Norfolk Estate farms to prevent predation of wild game birds. He also has a home and shooting estate at Carlton Towers, Yorkshire – also littered with snares. Here for the first time, we have captured a dog and a hare as they are caught in snares. 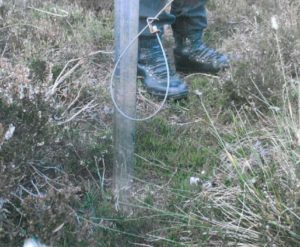 Deer, badgers are also victims of indiscriminate snaring. Our investigators help expose acts of cruelty to animals at great personal risk. Found an injured or dead animal in a snare? It’s important to act immediately. Defra ‘Independent Working Group on Snares’ stitch-up! Download the anti-snares petition and get your friends and family to sign. The protected creature had been lured to a ‘stink pit’ at High Denton Farm, near Ilkley. The Agreement on International Humane Trapping Standards (AIHTS) is an attempt to enforce an international standard on humaneness for traps relating to fur bearing mammals. Regardless of leaving the EU, the UK government has still agreed to implement.